【Make your Christmas Harmonious】- Works well in Christmas Day or Christmas themed party, for enhancing the festive atmosphere. Perfect to decorate your Christmas tree, ideal for tabletop decoration and centerpiece DIY. 【Perfect Christmas Tree ornaments】- These adorable ornaments are perfect for both residential and business decoration use they can be hung from Christmas trees, door knobs, on the fireplace mantle or anywhere with a hook. 【Unique Design】- Designed with a funny small jingle bell. 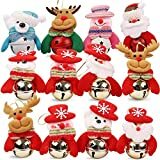 Cute, lovely and practical snowman, Santa, Elk Doll and reindeer set for life up your Christmas Holiday full of warm atmosphere. Each festive and collectible ornament is perfect for sharing with family and friends. 【Multi Choice】- 8 Christmas styles:3 x Santa Claus, 3 x Snowman, 3 x Elk Doll，3 x Reindeer feature a variety of classic and popular Christmas elements, absolutely suitable for upcoming Christmas! The ornament is ready to hang on your Christmas tree with a hanger attachment.